Winter is coming to the Chicagoland area. As it does every year, it is going to drop in temperature, and snow across the land. Animals in the area are looking for places to live and hunker down during the winter months in order to escape the cold air. Here are some ways that wildlife can find ways into your home and what you should look for this time of year. If you think you are being invaded by an animal call a wildlife removal service immediately! Do not attempt to remove the animal yourself; you could be placing yourself and your family’s life in danger! 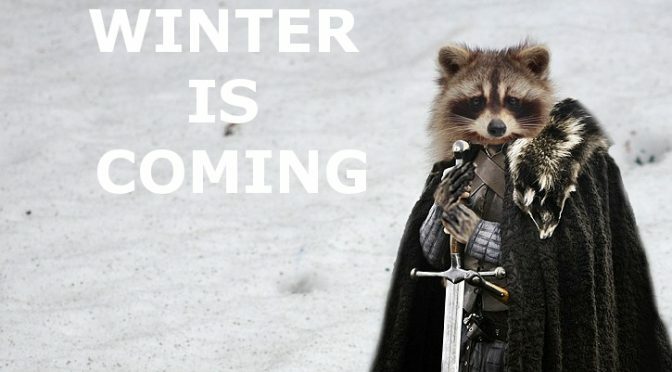 Raccoons are the peskiest creatures that could be affecting your home during the winter months. Raccoons will damage your roof or soffits in order to get into your attic to find shelter from the elements during the winter. While in your attic these creatures can chew through electric wires, damage insulation, destroy items stored there, and use your attic as a bathroom. Raccoons will take advantage of any hole in order to get into your home. Even a small roof opening can give them the ability to tear a bigger hole to gain access to your attic. Raccoons can also get into your chimney. They can then find access to the main floors of your home through the open flue. If you are hearing scratching noises in your home, random rustling sounds in your attic or scuffling up your chimney call a local animal removal specialist in your area. Raccoons can be dangerous, especially a female raccoon protecting her young. Do not try to remove a raccoon by yourself! Identify All Problems– By sealing up all the openings you’re; preventing animals from getting inside and also potential water leaks on home. Replace Damaged and Rotten Wood – If there is any rotting or soft wood on your home, it makes it easier to get in. You can repair those areas which will make it more difficult for an animal to chew their way inside. Screen Your Vents – You can screen your chimney, bathroom fan, stove vents, peak vents, and other access vents outside with a wire mesh screen. This is one of the best ways to protect yourself from all animals invading your house this winter. Tree Trimming – Cut your tree limbs back 12 to 15 feet from the house which can prevent squirrels jumping onto your home or on your roof. Since opossums are nocturnal, they usually stay in their den all day. However, they are always moving around. They might have more than one den in an area. That is why sometimes it is hard to tell if an opossum is occupying a den. You might hear sounds at night, but they might go away and come back periodically depending on when the opossum moves. 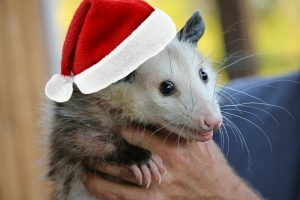 Do not try and remove an opossum by yourself; they can be extremely aggressive since their only two main methods of defense are showing their teeth and playing dead. Rely on an animal removal service in your area in order to ensure that you can remove the opossum safely from your home. 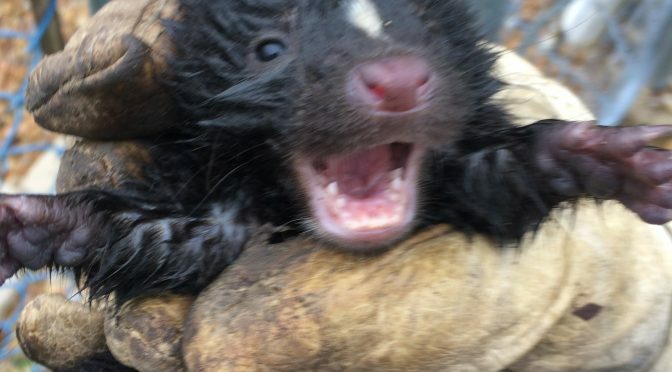 Animal Trackers Wildlife is your local animal removal specialist company started by two guys who grew up in the Northwestern Suburbs of Illinois. They have been safely removing animals from homes for over 17 years. They are always ready to help protect you and your family from invading wildlife during the winter. Call us today and let us help you now! Running a business is hard, having to deal with animals invading your business is more difficult. There are several reasons why having animals living inside the building of your business is bad, but how to get them out discretely is more of a challenge. Animal Trackers Wildlife has been helping business owners deal with their animal problems for years. Knowing the delicate nature of businesses we can take care of the problem with minimal interference. So if you have a problem with squirrels, raccoons, skunks, opossums, or feathered friends. Call us, and we’ll take care of it. For commercial businesses, animals inside tend to distract customers if not scary. Animals inside your commercial business give you a very negative stigma. Customers will think that your company does not care about its property or customers. Removing them discretely is as important as removing them. Discrete animal removal is a common service that we provide our Commercial Customers. Making sure that your clients never knew the animal was there in the first place is key. Of course, if the animal is loose inside, quick animal removal is also essential. Our expert trappers can quickly capture the animal and remove it once on scene. For industrial businesses, animal removal is a little different. It is not the presence of the animal that causes the most disruption, but the damage the animal and nesting can cause. Animals can claw and chew the walls, wires, and pipes of businesses. They also tend to gather natural nesting materials which pose a potential fire hazard. Capture and removal of the animal is critical but making sure that the damage they caused is exposed and the mess they create is cleaned up will help to ensure that your business doesn’t suffer. Animal removal is not just about getting the animal out of the building but making sure that they can’t get back in. For some animals, this is about relocating, but for all, it is about making sure they can’t get back in. Identifying their entrance point and then sealing it so that they can’t get back in is key. Animal Trackers not only can remove the animals, but close any entrance that they used, or could use. So for the best animal removal make sure to give us a call!